Archival Designs' Luxury Mansion House Plan Monclay. 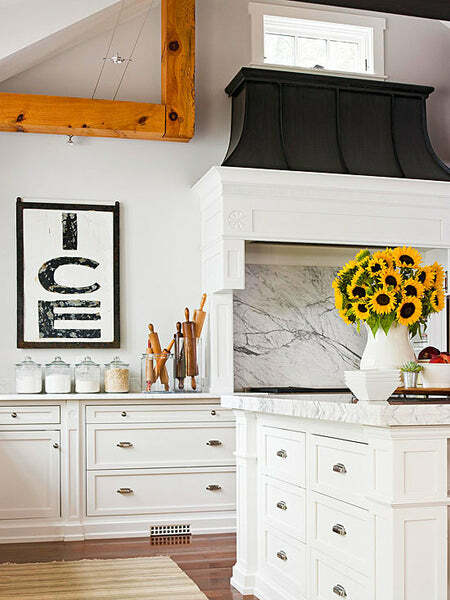 With winter upon us, here are some ideas to freshen up your kitchen! 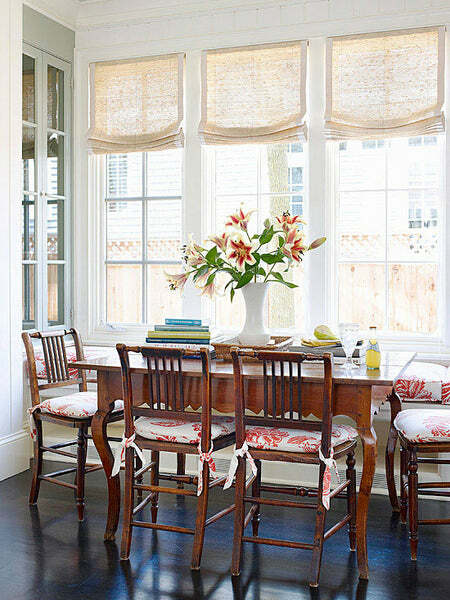 Outfit your banquette or breakfast nook with an ensemble of pillows. These pretty additions will decorate the eating space when it's not in use and provide an extra layer of comfort when you are gathered around the table. Even though a kitchen is called upon to be highly functional, that doesn't mean it can't be stylish. Display artwork like you would in aliving room or bedroom. 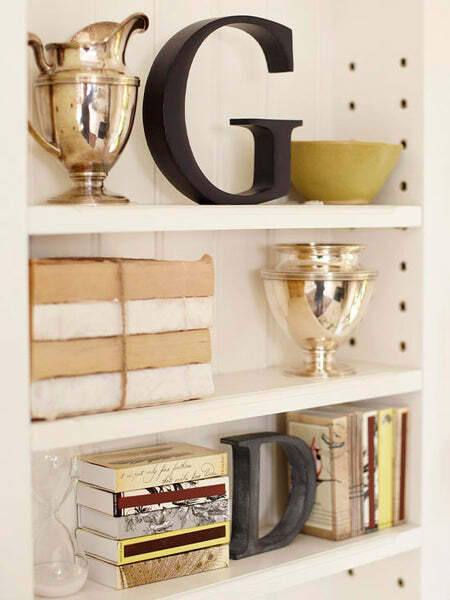 Consider vintage food or grocer signs to add collected flair, or a pretty painting for a more elegant vibe. Adequate lighting is a must for the functional aspect of a kitchen, but fortunately, this important element can also be highly decorative. With so many styles available, you can make a truly unique statement with light fixtures. 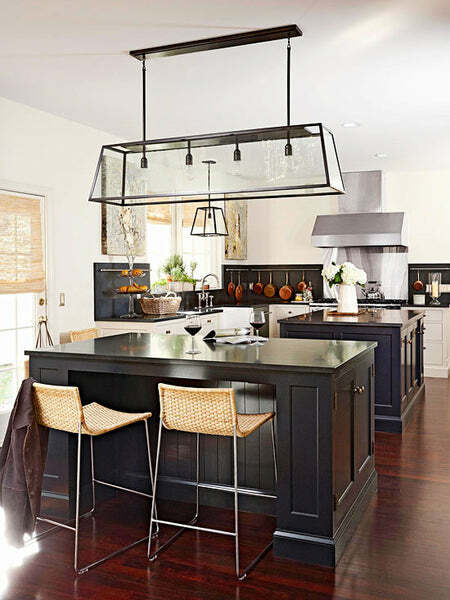 In this kitchen, a large oblong lantern fixture crowns the island, while a matching, smaller fixture hangs over the sink. Give old chairs a boost by re-covering the seats or adding new cushions. Choose a fabric that goes with other elements within the kitchen so your new addition blends seamlessly. 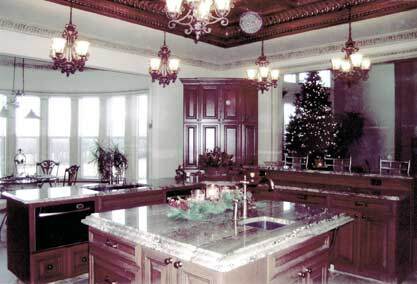 Kitchens typically don't have a lot of wall space, thanks to cabinetry, backsplashes, windows, and doorways. Use limited wall space as a chance to display a color you might not otherwise choose for a large wall or whole room. Here, a sable brown colors the space above the windows, which grounds the light kitchen. 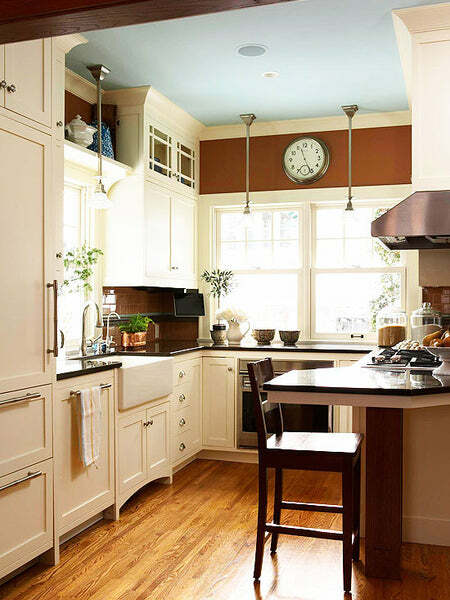 Also, look to the "fifth wall" of a room -- the ceiling -- as a place to add color with paint. Activate the space in front of a window as bonus storage. 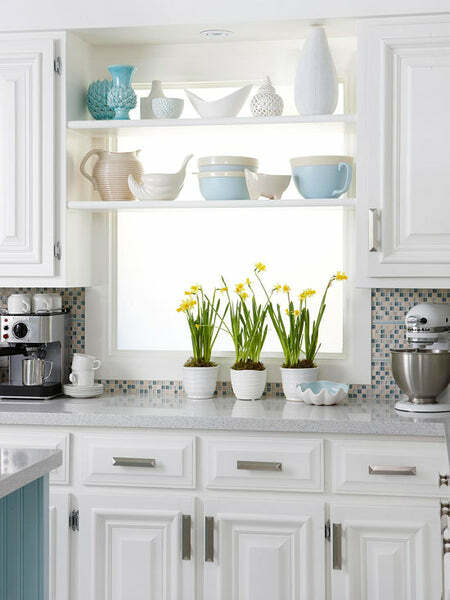 Mount shelves in front of the window by either anchoring them to the wall or along the sides of upper cabinets. This handy solution can also block a not-so-great outside view while allowing light to come in from the window. Make your kitchen feel more like a living space by incorporating nonkitchen items into your decor. Oversize decorative letters put a signature on this kitchen, as does a collection of personal objects. This display is in a niche out of the kitchen's main work core to keep it out of the way of splatters and leave space for kitchen essentials to be stored where they are used most often. Look to the top of your cabinets as another place to insert style. 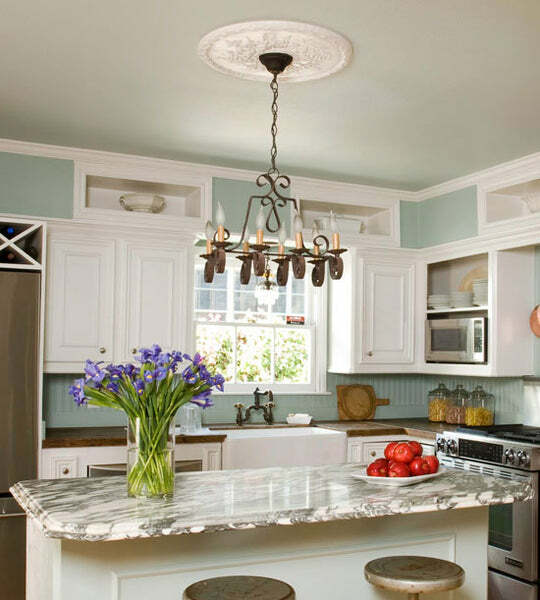 Upgrade an existing light fixture by crowning it with a ceiling medallion. These affordable pieces are available at home centers in a variety of styles and sizes. Plus, they can be painted and are easy to install. Archival Designs' Luxury Mansion House Plan Chateaubriand.